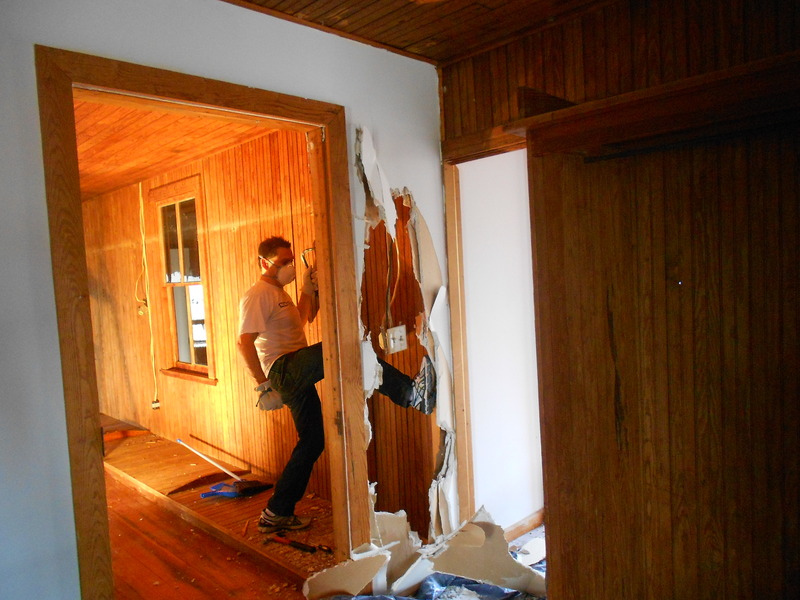 Home » Uncategorized » Hi Ho, Hi Ho, A Tearing Out We Go. Hi Ho, Hi Ho, A Tearing Out We Go. No, don’t freak out, we’re not touching the downstairs or the landing right now, and down there it’ll only be the second kitchen and newer additions that’ll be going. Onwards to our progress! There is, to a degree, difficulty in describing events that took place when one wasn’t present. See, I work during the weekends usually, so I don’t get to be around when Mom and Dad are working on the house. They do, however, take notes and pictures for me. So, I will do my best to catch you all up on what’s been going on and touch on things that occurred before the last post. 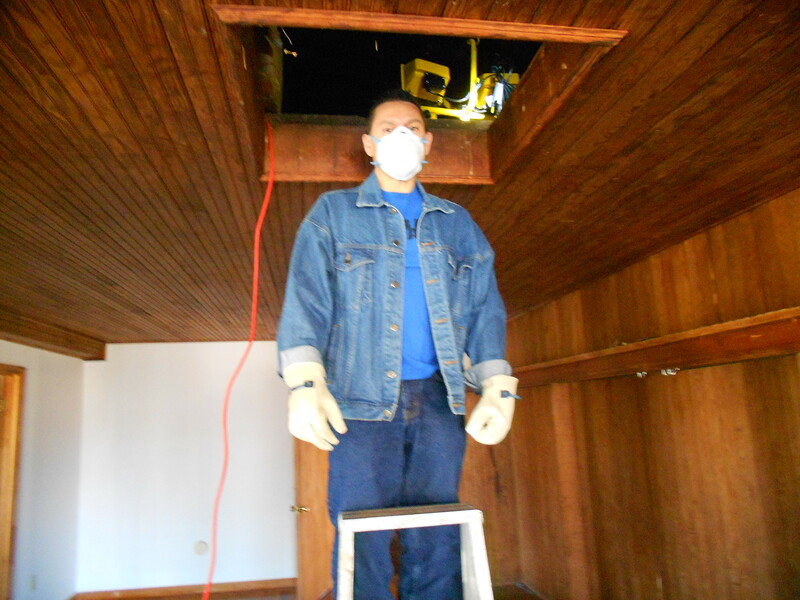 Dad getting ready to venture into the attic. Mom and Dad’s first official day at the house was mostly involved with cleaning and measuring and planning and discovering some things. Dad pulled some boxes and things down from the attic. 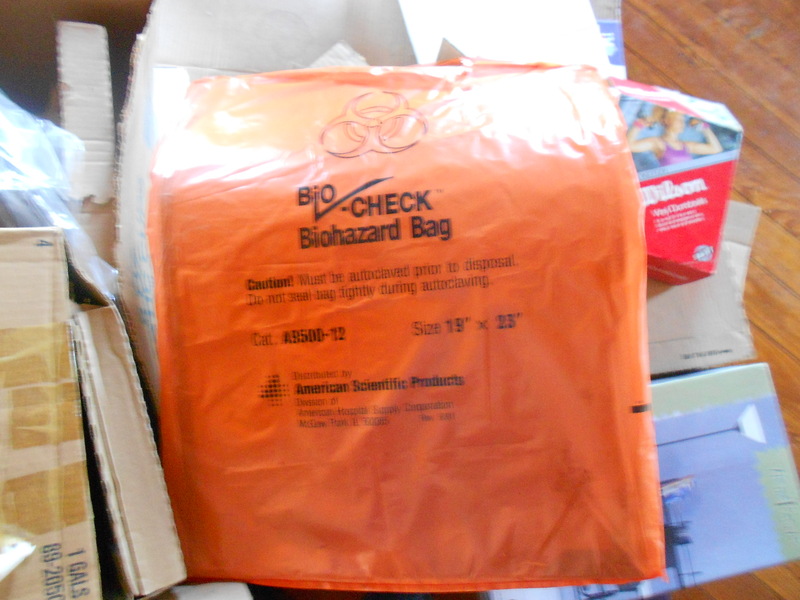 About four boxes of paperwork from the last owners that I’ve yet to go through and a scary orange bio hazard bag with an desk blotter in it. Raised some questions, all of which have gone unanswered. I wanted to test the contents for blood, you know, just in case. The found bio hazard bag. Upon moving the stove in the upstairs kitchen, Mom also found garlic and a still packaged pizza crust. I looked for a date on it but couldn’t find one. It’s time of it’s creation is unknown. The garlic of course, was probably left over from one of the former tenants of the apartment who feared the coming Vampire attack. Don’t deny it, you all know it’s coming. They finished off the day by having dinner at The Farmer’s Daughter where everything comes with hush puppies and most of the menu is fried. I myself have yet to dine there so I cannot describe it further. We’re gonna need a lot more Old English to polish this place up. 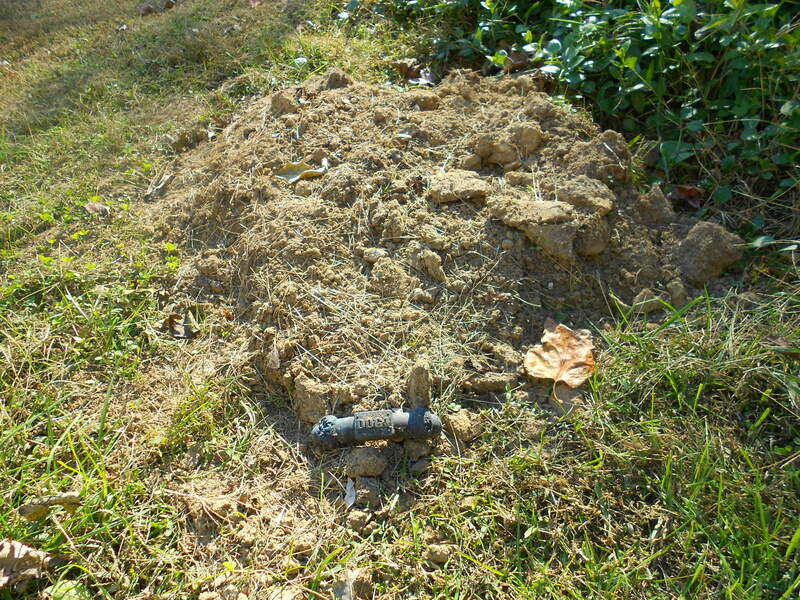 We also may or may not have a deceased dog buried in our backyard. But considering we’re across the street, on two sides, from cemeteries, we’re not really freaked out about it. Also, I named our possibly fictitious ghost dog Steve. Yes, I’m going to name everything. The weekend after that Mom and Dad got a lot done and we have a solid plan for the layout upstairs now. It’ll leave us with three bedrooms, two bathrooms, the kitchen, living room, dining room, and a pantry. Yes, the upstairs is that big, it’s insane. Basically what they did was open the upstairs hallway back up by removing the wall and door that used to separate the two apartments and take out the old dressing rooms that lined (and severely crowded) the hallway upstairs. Dad also got some Krav Maga practice in with his front kicks. Taking out the wall separating the two former apartments. In addition to that they took out the cabinets in the upstairs kitchen and discovered just how heavy a cast iron sink can be. Also, a limp wrist wavy thing apparently means something about plumbing and walls and crap in parents speak. I dunno, they were explaining their day to me after I got home from work and started communicating with hand signals. Now onto last weekend. The weekend of insulation. Of honor and valor. Of feats of strength and wishing the elevator was hooked up…I did mention the elevator, didn’t I? Barely? Hm, well I’ll get to that in a minute then, sit tight. Back on topic, the insulation came last weekend for the attic. Now there was already insulation up there, but Dad decided we’d double up on it and lay more. So Saturday dawned bright and cold. Mom and Dad woke, readied themselves, and drove to the house while I went off to my job to be responsible. Bah. In hindsight I got the better day out of it. 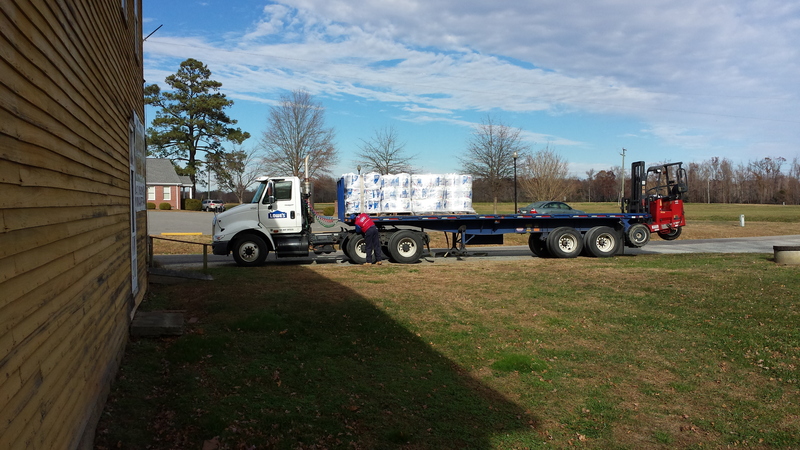 Once at the house, our trusty Lowe’s delivery man, Tadpole, (for that was his name) brought the requested eighty-seven rolls of insulation. 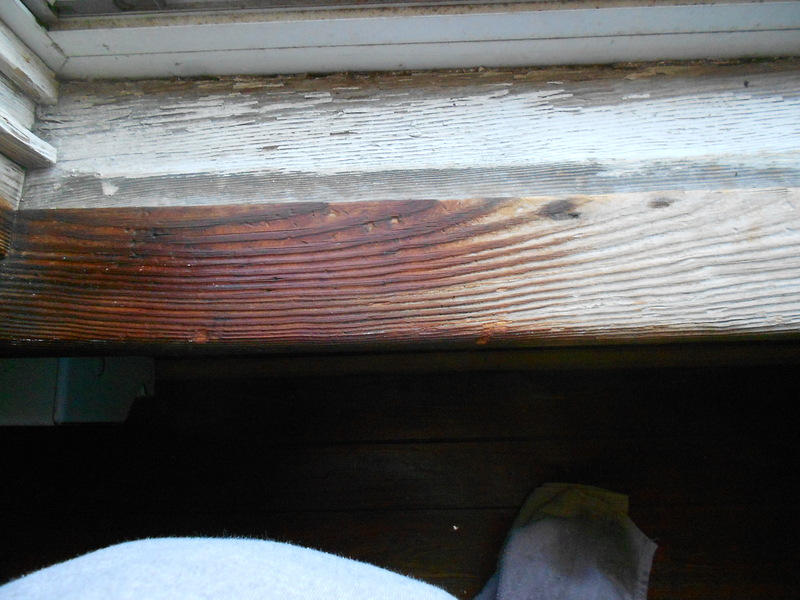 All of which Mom and Dad had into the house and upstairs in under an hour. Because they’re frickin animals dude. Animals. 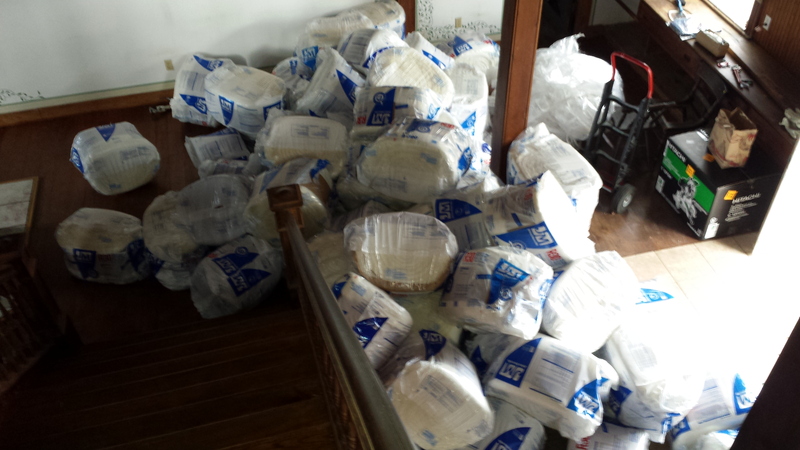 All that insulation had to go upstairs. 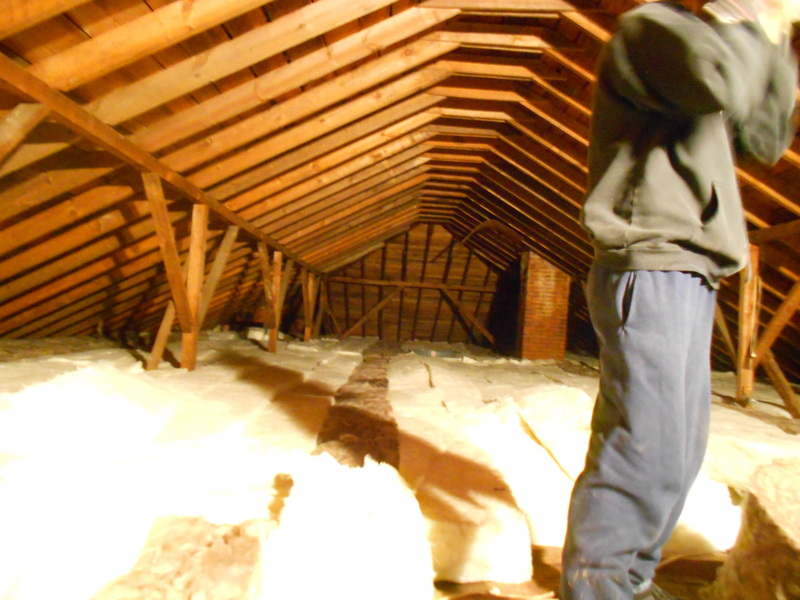 In case you needed more proof of how big this place is, that’s the insulation for the attic. 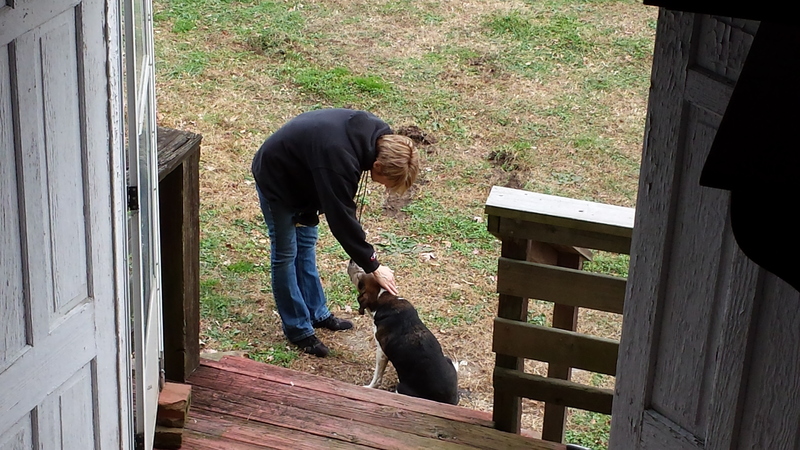 Speaking of animals, Mom made a friend! An old dog, blind in one eye that was out for a stroll. She said he was friendly and well fed, we just don’t know where he belongs. Claude, he shall be named. Claude, our new half blind dog friend. The attic while putting in the extra insulation.